This set includes: (1) Zalto Denk'Art Universal Glass, (1) Zalto Denk'Art Burgundy Glass, (1) Zalto Denk'Art Bordeaux Glass . 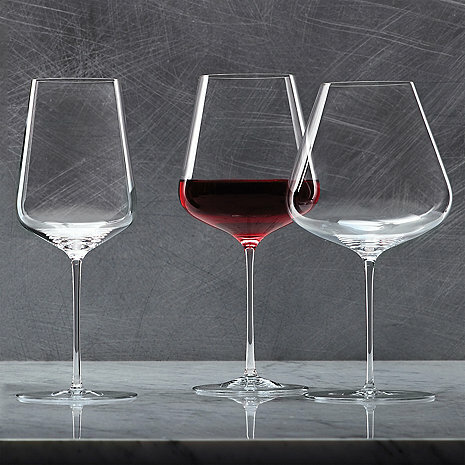 The Zalto Denk'Art Universal glass is recommended for full-bodied to powerful wines, which are expressive but also show minerality and smooth character. Accentuates complexity and finesse. Especially for: Chardonnay, Chianti, Riesling and 'Smaragd'- wines from the Wachau region of Austria. Lead-Free. Dishwasher-Safe. Does the universal wine glass give as good of a taste as 3 different shapes? BEST ANSWER: I wouldn't go so far as saying there is a noticeable difference in taste between the Universal, Bordeaux, and Burgundy glasses. That being said the drinking experience is very different; enough that I developed a strong preference for the Bordeaux. For me, the burgundy feels too fragile (big bowl, tiny stem). I can actually see it wobble when I swirl. The universal is great for sitting at the table for a formal meal but doesn't encourage you to smell as much as it encourages you to drink. The Bordeaux is the one I would take with me to my favorite chair, relax and use to enjoy a bottle that is too nice to share with guests. Make any sense at all? If I were to buy again, I would not get the Burgundy glasses, just universal and Bordeaux. The universal is excellent, but the Bordeaux even better for aroma appreciation. The Burgundy glass is too big. 1 glass for Red 1glass for white 1glass for champagne total ??? BEST ANSWER: Jimmy, This set comes with 3 total glasses. We love our wine glasses. We also purchased water glasses. We did not need champagne glasses have white, red and water. Am I purchasing 3 glasses or 12, if I place this order? As if you are drinking from air, light, even durable to an extent as they are dishwasher safe. Just make sure to get them out right away to make polishing them easier like any other glass. Just what was wanted by the recipients. They are very pleased. These are the very best. While pricey and a long wait, they are totally worth it. Beautiful glasses - elegant look and feel - although slightly nervous about breaking them ! The Zalto Denk'Art wines are beautifully made, remarkably sturdy and look great on your dining room table. Your first inclination will be to reserve them for special occasions -- after a few days, you'll find yourself using them every day. While not inexpensive, these glasses are a great value. The glasses are light, perfectly shaped and make you feel special when you drink wine from them. Though I am short of expertise, I think they also enhance the aroma to provide a better experience. Do watch the videos on how to clean and polish the glasses though- very different than we are used to for more commercial grade wine glasses. These are the best wine glasses on the planet! After having one glass of wine, you will order more! Your review must be at least 50 characters in length. --- NO IT MUSN'T! Great glasses, I bought a couple to compare to the Reidels I own. I plan to buy more! Very impressive, beautiful glasses. A bit fragile so be careful. Absolutely love them. These were a gift for my son who is a 1st level Somm. He loves them and states that there is a definite difference (improvement) in taste & aroma compared to other glasses. These will be an asset to him as he pursues his 2nd level Somm. So disappointed with these glasses. Lovely for drinking, as the other reviews point out, but they are impossibly delicate. I always hand wash my glasses after using, and while cleaning the Bordeaux glass after just the third use, the stem snapped like a dried out twig. At these prices, I cannot envision purchasing a replacement. Good wine is expensive enough.